Dart Storage is a self-storage facility located minutes from downtown St. Paul, providing secure, convenient, and affordable storage to Twin Cities residents. Our weatherproof storage containers come in various sizes for residential and commercial purposes, and are housed on a secure gated lot. 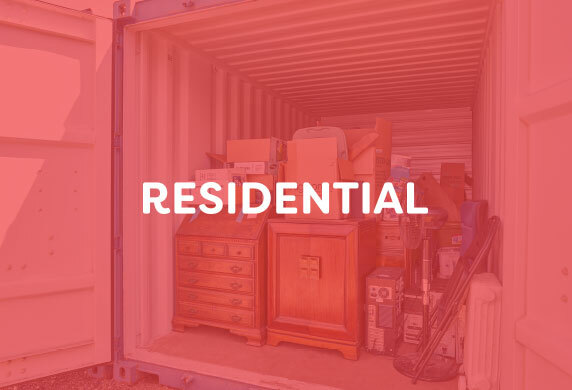 We offer long-term and short-term storage rental options with a one month minimum time commitment. Dart Storage is an authorized U-Haul dealer. We sell moving supplies and rent equipment to help you move your possessions to and from our secure storage site. Call 651-225-9000 today to ask about availability! Our gated outdoor storage area offers the same security as self-storage warehouses at a more affordable rate. All our containers have easy drive-up access, so you can come and go on your own schedule. Our secure storage containers are 100% weatherproof and vermin-proof. Containers are available in a variety of sizes to accommodate all residential and commercial storage needs. Our secure weatherproof storage containers are an affordable storage solution for both residential and commercial storage needs. At Dart Storage, the safety and security of your personal belongings is our priority. Perhaps you’re between homes, need a safe place to store furniture during a remodel, or you recently downsized and want to save your overflow furniture to pass down to your kids when they buy their first home. Dart Storage offers a secure all-seasons storage solution for every season of life. CALL 651-225-9000 TO SIGN UP. 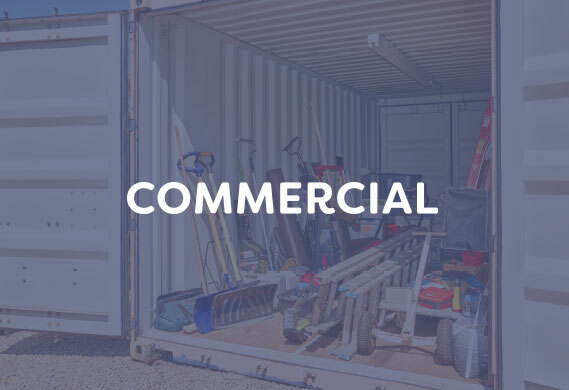 The durable storage containers at Dart Storage will safely house your business inventory or equipment during the off-season, a move, or renovation. All our units have drive-up accessibility, so you can retrieve your inventory whenever you need to restock. There’s always seasonality in business, but the seasons have no effect on our weatherproof, vermin-proof containers. Your assets and investments are safe with us. 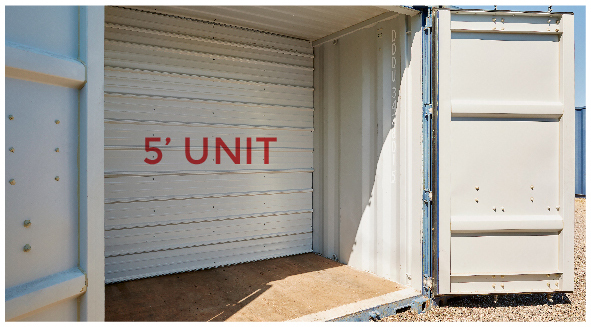 Our smallest unit, the 5' size is ideal for a studio apartment or the belongings and furniture from one midsize room. The 5’ unit is also a great size for storing off-season garden tools or yard equipment. A 10’ unit can typically fit the contents of a one-bedroom apartment. It can be a good solution for temporary storage during home renovations or for overflow inventory storage. You can fit the contents of three bedrooms in a 15’ unit. This unit is ideal for larger items such as pianos, couches, and off-season snow-removal or lawn-mowing equipment. The entire contents of the average family home will fit inside an 8x20’ storage unit. The 20’ unit is a great storage option if you’re between homes or your current home is being renovated. 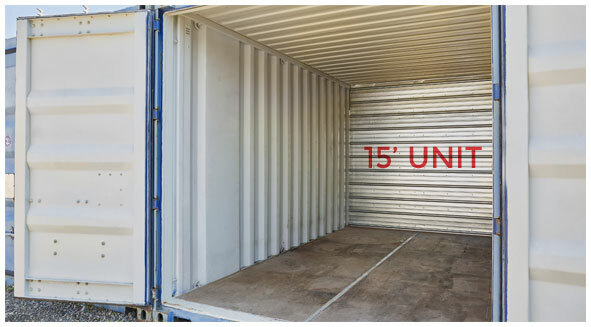 Offering over 300 square feet of space, our 40’ units are typically a commercial storage option. However, this size unit can also hold the entire contents of a large 5- to 7-bedroom house. Call 651-225-9000 to check our availability. A Dart Storage representative will assist you to determine which container size will meet your storage needs. Get your first month free by making a 6-month storage commitment. Arrange moving assistance by reserving U-Haul equipment through Dart Storage. Enjoy your secure month-to-month storage, and cancel at any time.